Chris Stapleton, Sam Hunt, and Jason Isbell are confirmed for the 2016 Bonnaroo Music and Arts Festival, marking its 15th anniversary this year. The event will feature approximately 150 musicians across 12 stages. The lineup also includes Pearl Jam, Dead & Company (two sets), LCD Soundsystem, J. Cole, Ellie Goulding, Macklemore & Ryan Lewis, Tame Impala (late night), Death Cab for Cutie, M83, Haim, Miguel, Big Grams (Big Boi + Phantogram), Tyler the Creator, Lamb of God, Blood Orange, Kamasi Washington, Waxahatchee, Vince Staples and more. Bonnaroo will take place June 9-12 in Manchester, Tennessee. The lineup was revealed on Conan. Watch the announcement below. The three-day, two-stage country music festival Windy City LakeShake will return on June 17-19 with Jason Aldean, Lady Antebellum, Tim McGraw, Brooks & Dunn, Sam Hunt, Thomas Rhett and more slated to play the festival’s second year, set against the city’s spectacular skyline. Festival passes will go on-sale on Jan. 29 at 10am CT at LakeShakeFestival.com. Festival-goers will be able enjoy panoramic views of Chicago’s lakefront while experiencing a lineup that also includes A Thousand Horses, Chris Janson, Jana Kramer, Jon Pardi, Granger Smith feat Earl Dibbles, Jr., Travis Tritt, Charlie Worsham and more. Attendees will also have the option for VIP packages offering access to the shaded VIP Lounge with private cash bar, premium elevated viewing, lounge and reserved seating as well as air-conditioned restroom facilities, in-seat wait service, a dedicated festival concierge, an express festival entrance and more. 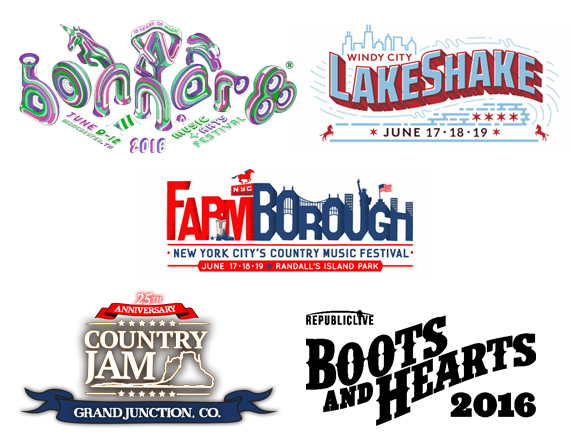 A collaboration between Live Nation Entertainment and Founders Entertainment, the two-stage FarmBorough Festival will return to New York City on June 17-19 for a second year with a lineup including Jason Aldean, Brooks & Dunn, Brantley Gilbert, Toby Keith, Tim McGraw, Thomas Rhett, A Thousand Horses, Billy Currington, Lonestar, Kacey Musgraves, David Nail, Eric Paslay and more to be announced in the coming weeks. Festival passes will go on-sale on Jan. 29 at 10am ET at FarmBoroughFestival.com. The 25th Annual Country Jam festival has added more artists to its lineup. Canaan Smith, Aaron Watson, Lindsay Ell, High Valley, Drake White and The Big Fire and Stephanie Quayle are scheduled to perform June 16-19, 2016 at Jam Ranch outside Grand Junction, Colorado. These artists join the previously announced headliners – Zac Brown Band, Blake Shelton, Brad Paisley and Lee Brice – as well as Trace Adkins, Big & Rich, Joe Nichols, Tyler Farr, Easton Corbin, Chase Bryant, Darryl Worley, Neal McCoy, Halfway to Hazard and Annie Bosko.